Family and friends of Charlie Simmons are raising money to pay for uninsured medical expenses associated with his liver transplant. Charlie lives in Strasburg, VA and is being treated at UMMC in Baltimore Maryland. In 1995 Charlie Simmons was diagnosed with ulcerative colitis. This disease is a chronic disease of the colon or large intestine and the best way to explain what happens is inflammation of the inner lining of the colon. He has lived with this disease for many years now and has dealt with many flare ups causing numerous trips to the doctor and hospital. Two years after the initial diagnosis his doctor’s did a liver biopsy and an ERCP (Endoscopic Retrograde Cholangiopancreatography) which looked into the bile ducts to check for sclerosing cholangitis. This condition is a particular form of severe inflammation and scarring that develops in the bile ducts. The results from this test were that Charlie would need a liver transplant in approximately ten years. On March 18, 2007, Charlie was admitted to Fair Oaks Hospital with another flare up. 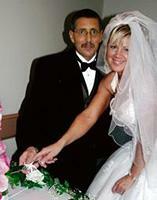 This was only five days prior to Charlie and Debbie’swedding, which was set for Saturday, March 24, 2007. (See photo above…notice how “green” Charlie looks) It was this flare up that then led to the findings from the doctor’s that Charlie’s liver wasn’t functioning properly and inevitably he would need to have a liver transplant. The doctors discovered that his right bile duct was 80% shut down with sclerosing cholangitis. There are continuous “flare up’s” for Charlie where a dominant stricture occurs in his right hepatic duct. When this happens he has to go through biliary stint placement. According to the CCFA (Crohn’s and Colitis Foundation of America), sclerosing cholangitis is rare and ultimately can cause the need for a liver transplant. CCFA states only approximately 5% of patients with Ulcerative Colitis develop sclerosing cholangitis and unfortunately Charlie has become part of that 5%. In a normal person bile travels thru the bile ducts and into the liver where it is then processed with no problems. In Charlie’s situation it’s completely different. In some occasions for Charlie his bile will travel to the bile ducts and STOP! This is when blockages occur in the ducts and there is no where for the bile to go. This causes a major infection and for Charlie another trip to the hospital. His doctors then have to put a stint in to re-open that area up and to keep the bile flowing. The stint goes in for approximately 30 days to open the area up, allow the bile to begin flowing and then it is removed. The problem is this is a continual issue approximately every six months. The risk for liver cancer for Charlie is also increased due to this disease and the doctors are constantly checking on him to ensure this has not occurred. Charlie has insurance but, his lifetime allowance cap is only $400,000. With his ulcerative colitis and all the other complications and flare up’s leading up to the present $200,000 is already gone! The cost of this liver transplant will more than wipe out his lifetime cap of insurance leaving him to fend for himself for the rest of his life including the after care of the transplant. On Monday, March 2, 2009 Charlie was blessed with a new liver!! Although the largest issue has been resolved and he is recovering wonderfully the bills will continue to come for the rest of his life. The transplant surgery has completely exhausted his insurance. Funds need to be raised for the rest of his life to cover his medical expenses and large amount of medication to keep this new liver healthy! Any help…large or small…is greatly appreciated!! On Friday, April 8, 2011 Charlie was told he would need another liver transplant. As you know the cost of this life saving surgery is high and we could really use everyone’s help! Please visit his caringbridge site (link on this page) for more information on how he is doing. And again any help you can give is greatly appreciated! Please keep Charlie in your prayers as he takes this walk again! Adding to the family’s stress, even with medical insurance, funding this life-saving procedure presents a financial challenge they cannot meet alone. To help offset their enormous uninsured expenses, a fundraising campaign has been established in Charlie’s honor through HelpHOPELive. Serving the transplant community for the past twenty-five years, HelpHOPELive provides both tax-deductibility and fiscal accountability. Contributors can be sure that monetary donations will be used only to pay or reimburse medically-related expenses. To make a thoughtful contribution to Charlie’s fundraising campaign, click the “Contribute Now” button. To email this page directly to others in your community who might wish to learn about Charlie’s campaign, click the email button and type in as many email addresses as you wish. Debbie and Charlie, we think of you so often and pray that you will soon overcome the challenges you are facing-our hearts and prayers will remain strong. Charlie & Debbie - you and your family are in my prayers. Debbie - Watch those nurses...he's awfully cute! Love you guys. Charlie and Debbie, Prayers and healing thoughts are coming your way. The best is yet to come. Love to you both.